Any cake... Any style... Any time!! As every cake is an individually crafted design made just for you, the price of each confection is determined by the size, design, level of detail required, flavors, etc. 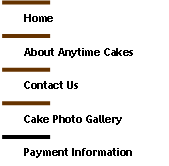 Anytime Cakes LLC accepts credit card payments via PayPal. You do not need a PayPal account in order to use this service. PayPal now accepts Visa, MasterCard, Discover or American Express. PLEASE ONLY PROCEED TO PAY VIA PAYPAL IF YOU HAVE ALREADY VERIFIED YOUR ORDER WITH ME VIA EMAIL OR PHONE AND HAVE RECEIVED YOUR INVOICE.